The Pivithuru Hela Urumaya (PHU) today demanded the resignation of Prime Minister Ranil Wickremesinghe over the Central Bank (CB) Bond sale scam. It said if the Premier didn’t resign, the party would be compelled to bring in a no-confidence motion against him. “The bond issue took place in the Treasury, when it came under the purview of Prime Minister. Former CB Governor Arjuna Mahendran, who is in hot water today, had said that the controversial deal was made following the directions of the Subject Minister. 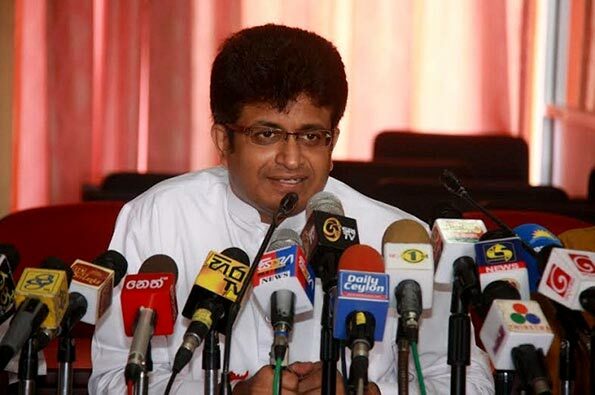 Therefore, the Premier should resign,” PHU General Secretary MP Udaya Gammanpila told a news conference. Believe that is a reasonable call. Pavithra Wanniarachchi should succeed RW as Prime Minister; she is presidential material. The UNP must continue in the Yahapalana Government as per agreement with the SLFP lead by MY3. The Yahapalana Government has important tasks and commitments and should fulfil the aspirations of the masses manifested on 08 Jan 2015. Pivithuru Hela Urumaya are a bunch of soothsayers who can predict Court outcomes, specially when presided over by the current blind Tamil CJ. This would have been happened in western country. If there’s any such concern or a scam , which government also attached in it then definitely PM, FM might have stepped down already. Currently any incident happened to a government officials, they will get interdicted till the enquiries are over. If they cleared by the court, his position will reimpose along with the old due salaries. Same should goes with the government ministers as well. Interdict them. They should resign and pave the way to do unbiased enquiries. Why this is not happening in Sri Lanka? Even though the Yahapalana team is in power, they are not showing this ultimate truth. So are they ‘YAHAPALANA’ gang? not any more, or never before. JO is always making statements, media showcases only. Not actions. If we have a powerful opposition, they should be able to make sure PM and the government is resigned and go for elections. Or keep them at a bay until all enquiries are over. Wasting time. money and words….. SL is no longer a place to live. The PM should have resigned by now and the big boss too, having instructed the Police not to pursue his son who smashed windows and security guards at the disco. It is 3 weeks since this incident which took place in an area which has the most intense CCTV coverage. Doesn’t the boss realise that protecting his son will only lead to more violent incidents in the future? The boss is not being a good parent in this instance let alone, being a good President. The boss and PM should resign and Kalu Jayasooriya should become the President and Sarath Muttuhettigama the Prime Minister.